Cameron's parents don't recall ever going "Trunk-or-Treating" during October when they were growing up. So, it was exciting for the entire family to attend their first Trunk or Treat outing at a local church. If you haven't been exposed to one of these events, it's when several families get together in the church parking lot, park their cars, and cleverly decorate their trunks. They pass out candy to kids who have the advantage of collecting Halloween treats in a safe, confined area, and in a short amount of time. Cam and his buddy, Will, made their way around to each trunk. A big thanks to Auntie Jo and Will for trying out this new event. Chris completely outdid himself this Halloween by creating the Space Shuttle CamMobile, piloted by Commander Cam! The shuttle was built and painted by Chris and Cam. When Jane wondered why there was some black paint on the front of the space module, Chris explained that it was from "re-entry." 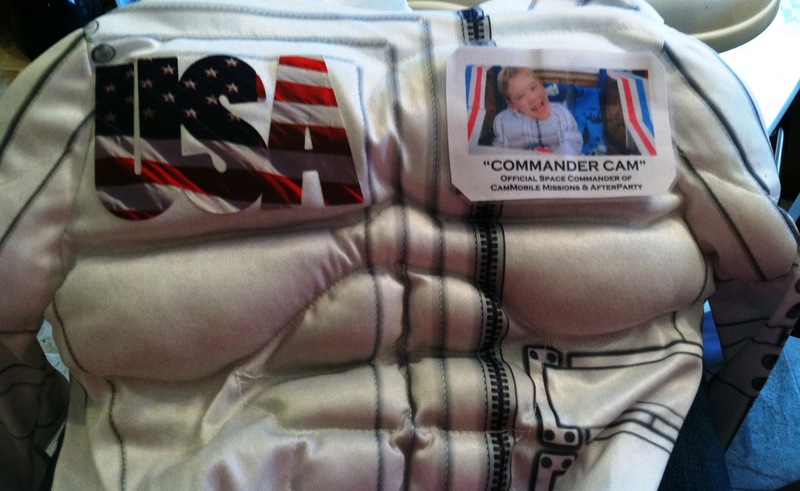 The space suit, identification card and space fabric were Jane's contribution. Cameron's ID card read: "Commander Cam" - Official Space Commander of CamMobile Missions & AfterParty. October 31st, although gloomy outside, ended up being such a bright afternoon and evening! FTCH, where Cameron's Dad works, has trick or treating festivities in the warm, dry office every year! Cam showed off his shuttle to many oohs and ahhhs by adults and kids. While Cam enjoyed collecting treats inside, he couldn't wait to see his buddies and go trick-or-treating outside. Emma and her sisters as well as other neighborhood kids all banded together to go door to door. In the evening, the space shuttle lights nicely led the way! The backside rocket boosters were a pretty cool effect lit up too. Cam's buddy, Emma, stayed with him the entire time, asking the other kids to wait...mostly because Jane had to chat with all the neighbors! The race down the empty street was one of the highlights for Cam with Emma on one side and Chris on the other. Even with the downhill fun, the treats all stayed intact. Cameron held onto his Halloween bucket very tightly this year and made certain that each piece of candy stayed inside. Being the sweet boy he is, though, Cam still let his parents pick out a few of their own favorites from his big pile of treats! So great. Hope he had a wonderful time.